Master Bath revamped! 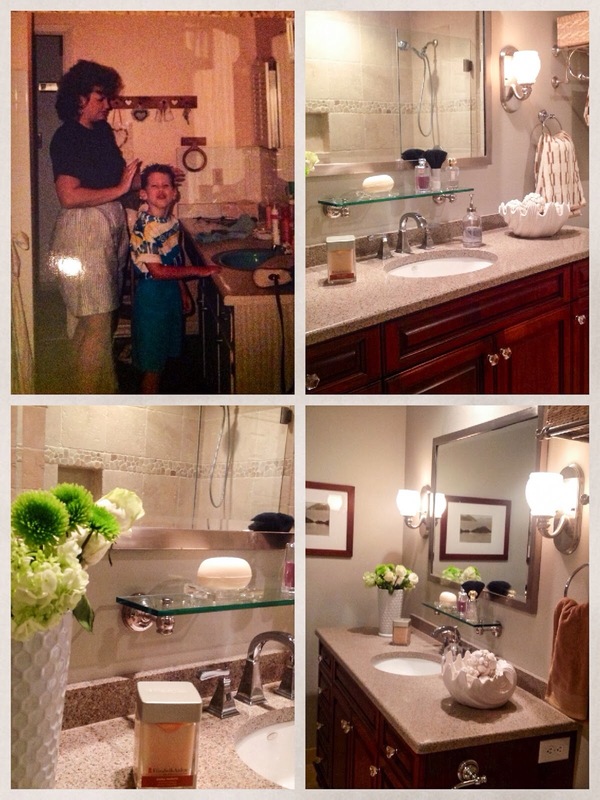 The Daily Nest: Master Bath revamped! Tacky decorating, 80's hair, and Mom shorts in the preceeding post! When we bought our house in 1987, this is what the main bathroom pretty much looked like, on the top left! Sad, I know! I wish I had a better photo of it. But, maybe you don't! Maybe it's all your eyes can take! And in the words of Seinfeld, "Look away it's hideous!" It had a turquoise sink and tub, pressed wood cabinets and about 3 layers of horrible linoleum. This is my oldest son in the photo, doing what he does best...being himself! Got to love him! After years of trying to work with the turquoise sink and tub, like painting it peach! Yuck! We finally decided to take the plunge and do a complete reno! I mean down to the studs! We replaced all the drywall, tore out the tub and put in a big walk in shower. Since there wasn't room for a nice large tub, we thought who needs it? And I've never regretted it! We put in frameless shower doors. So cleaning is a breeze! If you are debating on whether to spend the extra money on frameless...do it! Worth every penny! Also, we had the cabinet custom made, and although I love it I'm not sure I would spend the money on that again. I think there are plenty of good vanities that you can buy. We have silestone for the counter, and travertine tile for the shower walls, floors and baseboards. Other than keeping the travertine sealed, everything has been very low maintenance! I wanted it to have a spa like feel and I feel like we've achieved it! Look for more before photos of the house in the next few weeks! You may just have a good laugh!